that with the perturbation, the position errors are almost entirely in track; without the perturbation, the out-of-plane error becomes significant, especially for cases 1 and 3. The above studies are not sufficient to establish general recommendations for whether or not to include the secular perturbations in simple orbit generators. In view of the overall large error in these generators, there seems to be no point in including the perturbations unless a study indicates they are useful in a particular situation. The use of simple orbit generators is limited mainly to two situations: (1) when the orbit is so poorly known that the error contributed by the orbit generator is not a limitation (such as during an immediate postlaunch period); and (2) for simulations or analysis when the two-body position is in effect the true position. Even in this case, however, excessive extrapolation may result in the generation of an unrealistic position. (he reference vectors should contribute a negligible fraction of the allowable attitude uncertainty. Uncertainty in the reference vectors arises from two sources: uncertainty in the position of the spacecraft as described in the previous section, and uncertainty in the position of the reference objects themselves. The error in modeling the positions of the solar system bodies using the complete theories described below is typically on the order of 0.1 arc-sec (see, for example, [Clemence, 1961]); this quantity is limited mainly by the error in the observations useld to compute the model parameters*. The orbits of the major planets and the Moon are nearly circular. They are characterized by small eccentricity (the largest being about 0.2 for Mercury) and small inclination to the ecliptic (the largest being about 7 deg, again for Mercury). General characteristics of planetary orbits are discussed in Section 3.2 and tables of orbital elements are given in Appendix L.
The basic problem to be solved is the same as that discussed in Section S.4 for the orbital motion of spacecraft, except that in the present case the body in question may not necessarily be treated as a point of negligible mass. Two approaches have been adopted to the modeling of the motions of bodies in the solar system. These are the method of general perturbations and the method of special perturbationsf [Danby, 1962], In the former, the motion of the body is obtained from series solutions to the differential equations of motion. These solution* are expressed in closed form and typically involve power series in the time to give the mean motion, along with trigonometric series which provide corrections to the mean motion. The arguments of these correction terms are linear combinations of quantities relating to the mean motipn, with amplitudes that are either constant or are slowly varying functions of time. The method of special perturbations uses a direct numerical solution of the equations of motion. The result is a series of state vectors at different times; there is no closed-form expression that can be used to compute directly the locations of the bodies. Both of the above methods are used in the computation of ephemeris information. The locations of the inner planets (Mercury, Venus, Earth, and Mars) are usually computed using general perturbations because, for these objects, the Sun-planet interaction is closely described by two-body solutions. The locations of the five outer planets are computed using special perturbations because the two-body approximation is less valid. Historically, the motion of the Moon has been computed by general perturbations yielding a quite complex solution, involving over 1600 periodic terms. However, a preliminary theory of special perturbations for the Moon has been published [Garthwaite, et al., 1970]. * In some cases, spacecraft orbital data has provided positions much better than this. The mean residual in the position of the center of mass of Mars is currently on the order of 100 m, or about 10~4 arc sec at closest approach to the Earth [Standish, 1975]. Similar work has been done for tfee Moon [Garthwaite, et at., 1970]. * An illuminating nonmathematical discussion of both methods is given by Clemence, et at., [I960]. 'Published annually in the United States by the U.S. Government Printing Office and in the United Kingdom by H. M. Stationery Office under the title The Astronomical Ephemeris. [H. M. Nautical Almanac Office, 1961]. 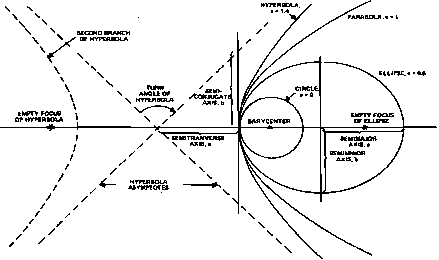 The ephemerides in the American Ephemeris are based on the work of Newcomb  for the inner planets, on Eckert, et al.,  for the outer planets, and on Brown  for the Moon. Details on these sources, modifications to them, and further references may be found in the Explanatory Supplement. The information in the American Ephemeris is given in the form of printed tables and therefore is not well suited to computer use. This defect is remedied by the JPL magnetic tapes (see, for example, Devine ) produced and periodically updated by the Jet Propulsion Laboratory of Pasadena, California, primarily for the support of deep space and planetary probes. The JPL tapes give planetary ephemeris information in a form suitable for computer use. The information is derived from numerical integration of the equations of motion between various epochs. These epochs are chosen to minimize the least-squares deviation between the calculated positions and "source positions"; these source positions are determined from the theories used in the American Ephemeris, except for the lunar ephemeris, which is computed directly from the theory of general perturbations. The JPL ephemeris data consists of the position and velocity in rectangular, heliocentric coordinates for Mercury, Venus, the Moon, the Earth-Moon bary-center, Mars, Jupiter, Saturn, Uranus, Neptune, and Pluto; these are referred to the mean equator and equinox of 1950.0. A routine for reading these tapes to obtain Sun and Moon positions (RJPLT) is described in Section 20.3. The JPL ephemeris tapes are still not especially convenient because of the high computer input/output time required to extract the needed information. For this reason, an adaptation of the JPL tapes on disk storage is used at Goddard Space Flight Center [Armstrong, et at., 1973]; these are referred to as the Solar-Lunar-Planetary (SLP) files and are accessed with routine SUNRD (Section 20.3). The information on the SLP files is in the form of Chebyshev polynomial coefficients valid for intervals of timë. The size of these intervals is a function of the speed of the body. The SLP files also contain coefficients allowing transformations between mean equator and equinox of 1950.0 and true equator and equinox of date. SUNRD, however, returns only the solar, lunar, and planetary position information. Algebraic Approximations. The accuracy of the complete ephemeris solutions is not always necessary in attitude analysis, and tapes and files are not always available. In fact, fairly simple closed-form expressions may be obtained for the motion of thé solar system bodies. The simplest approximation is to consider the mean motion only. This is equivalent to taking two-body solutions with circular orbits. This approximation will give, in most cases, errors in excess of 1 deg. Alternatively, Keplerian orbital elements (Section 3.1) may be used with an orbit generator, such as ORBGEN (Section 20.3). This approach will give errors well below 1 deg for the inner planets and the Sun (over a period of years), but in excess of 1 deg for the Moon. For the outer planets, osculating elements at particular epochs may be used with an orbit generator to obtain accuracy better than 1 deg, even for periods of several years on either side of the epoch. Additional accuracy may be obtained by including selected terms from the method of general perturbations. In the case of the Moon, the use of about 20 periodic terms will result in errors below 0.25 deg. The remainder of this section outlines the algorithms that can be used. Routines which implement these algorithms (SUN IX, SMPOS, and PLANET) are described in Section 20.3.
where L is the mean longitude of the Sun, measured in the ecliptic from the mean equinox of date; Mq is the mean anomaly of the Sun; e is the eccentricity of the Earth's orbit; and d is the number of ephemeris days since 1900 January 0, 12h Ephemeris Time* (Julian date 2,415,020). 'That is, 12h Ephemeris Time on December 31, 1899.
where ¿^ is the mean longitude of the Moon, measured in the ecliptic from the mean equinox of date to the mean ascending node, and then along the orbit; F is the mean longitude of the Moon's perigee, measured as above; Q is the longitude of the mean ascending node of the lunar orbit, measured in the ecliptic from the mean equinox of date; D = Lm — L is the mean elongation of the Moon from the Sun; and / is the inclination of the lunar orbit to the ecliptic. Again, the terms in d2 and d3 may be neglected.